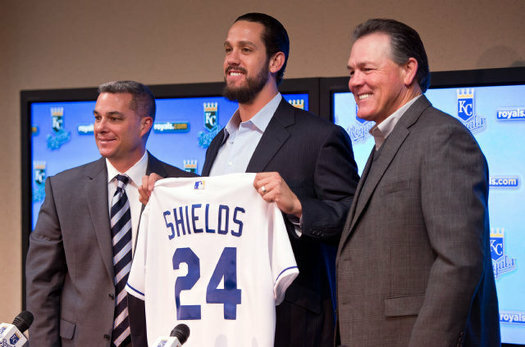 James Shields is a durable a proven #1 in the American League. The Royals will have him in the fold for the next 2 years at least. Shields will be the best pitcher the team has had since Zack Greinke. Shields did not accrue the moniker of ‘Big Game” for nothing. The pitching staff is settled, minus the one bullpen position, with James Shields, Ervin Santana, Jeremy Guthrie, Wade Davis, Luke Hochevar, Bruce Chen, Luis Mendoza, Aaron Crow, Tim Collins, Greg Holland, and Kelvin Herrera all having established a solidified position on the team. It appears the Royals will go with four outfielders, consisting of Alex Gordon, Lorenzo Cain, Jeff Francoeur, and Jarrod Dyson, and the infielders will be a composition of Eric Hosmer, Alcides Escobar, Mike Moustakas, Elliot Johnson, Miguel Tejada, and the winner of the Chris Getz/Johnny Giavotella second base competition. 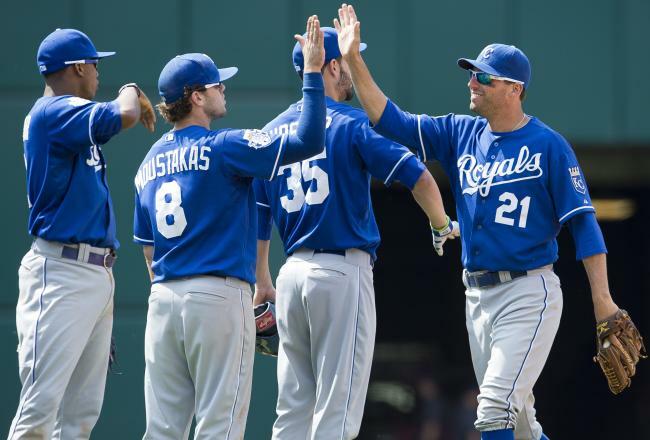 At catcher, the Royals will have Salvador Perez and either George Kottaras or Brett Hayes as Perez’s backup. The only apparent unanswered question is the aforementioned remaining bullpen spot, which could remain undetermined until the end of spring training. The assemblage of Nate Adcock, J.C. Gutierrez, Everett Teaford, Donnie Joseph, Guillermo Moscoso, Francisley Bueno, Louis Coleman, and Dan Wheeler, among others, is contenting at this infantile stage of spring training. Regardless of who prevails in securing the final spot, this decision will have a relatively insignificant impact on payroll, as most of the competing players are Pre- Arbitration eligible players with minimal or no Major League experience. With this foundation in place, the Royals have an estimated payroll of $82 MIL committed to 2013, Two final ancillary notes concerning the Royals’ 2013 payroll: the Angels are paying $1M of Santana’s $13M salary, and the Royals have Joakim Soria’s $750,000 Buyout on this year’s ledger as well. The Los Angeles Angels of Anaheim exercised Santana’s $13M option for 2013 before trading him to the Royals on October 31, 2012 for Minor – League Pitcher Brandon Sisk. In return, the Angels are paying $1M of Santana’s 2013 salary, and the Royals acquired one of the more durable starters in baseball. Since entering the Angels’ rotation in 2005, Santana has gone 96-80 with a 4.33 ERA and has made at least 23 starts in eight straight seasons. Although Santana struggled in 2012 (9-13 and a 5.16 ERA with a league-worst 39 HRs allowed), the 30-year old Right-Hander posted consecutive sub-4.00 ERA seasons in 2010 and 2011, including 17 wins in 2010 and a no-hitter against Cleveland in 2011. Shields has also proven to be a durable starter in the majors, making exactly 33 starts in each of the past five seasons. 2012 saw Shields go 15-12 – with a 3.52 ERA and 1.17 WHIP, which followed his tremendous 2011 season that included a third-place finish in the American League Cy Young Voting, a 16-12 record, 2.82 ERA, and 1.04 WHIP, all while leading the league in Complete Games (11) and Shutouts (4). Shields should provide an ace presence that has been missing since the Zach Greinke trade, and Shields’ $12M option for 2014 is a reasonable price for the 31 Year – Old pitcher if he has another Shields-like season in 2013. Jeremy Guthrie (2013 Salary: $5M – 1st year of a 3-Year/$25M contract). Acquired in a 2012 in-season trade with the Colorado Rockies in exchange for struggling Left – Hander Jonathan Sanchez, Guthrie has also been a stable presence in starting rotations, pitching at least 175 Innings in every season since 2007. Guthrie’s 2012 was a tale of two seasons, going 3-9 with a 6.35 ERA and inflated 1.69 WHIP with the Rockies, but he finished the season with a 5-3 record, 3.16 ERA, and 1.13 WHIP in 14 games with the Royals. His work with the club was enough to convince Moore to offer Guthrie a three-year deal that will significantly escalate to $11M in 2014 before dropping down to $9M in 2015. The unfailing target of fan criticism, Hochevar appears to be the leading candidate to win the fifth spot in the rotation. Although Manager Ned Yost has been a supporter of Hochevar, this is unquestionably a significant year in determining his future with the club. With one more year of Arbitration Eligibility remaining in 2014, the former number one overall pick led the league in Earned Runs given up in 2012 – posting a 8-16 record and a 5.73 ERA. Also in the mix for the fifth starting position, Chen is targeted for long-relief work if he fails to land in the rotation. Chen went 11-14 with a 5.07 ERA, 1.37 WHIP, and concerning 10.1 hits/9, but was a reliable contributor in 2011 (12-8 with a 3.77 ERA) and 2010 (12-7 record) and provides a valuable swing option. Acquired with Shields from the Rays, the Royals have made their intention known that they plan to use Davis as a Starter despite his success in 2012 out of the bullpen with the Rays. In relief, Davis went 3-0 and struck out 87 in 70 Innings (11.1 K/9 rate). Davis’ contract will pay him $4.8M in 2014, followed by three Club Options that could carry him through his final year of Arbitration Eligibility in 2015 ($7M) and his first two years of Free-Agent eligibility in 2016 ($8M) and 2017 ($10M). The Royals avoided Salary Arbitration with Paulino by agreeing to a $1.75M, one-year deal, but Paulino is unlikely to see action until mid-2013 due to having undergone Tommy John surgery in 2012. Paulino began 2012 strongly with a 1.67 ERA – and 39 Strikeouts in 37 2/3 Innings through seven starts before being injured. The heralded Cuban defector has struggled with injuries and consistency, as he underwent shoulder surgery in 2010 that has affected his pitching over the past three years. Although he still is considered a prospect, it is essential for him to demonstrate indicators of improvement in 2013. He has not started the clock on his Major League Service time yet. Holland impressively transitioned into the closing role following the mid-season trade of Jonathan Broxton to the Cincinnati Reds, finishing the season with 16 saves, a 2.96 ERA, and 12.2 K/9. For his career, Holland has maintained a profound 11.6 K/9 rate, and the Royals feel confident about Holland’s capabilities at the back-end of the bullpen. Another strong arm in the Royals’ bullpen with impressive velocity, Collins, entering his third season in the team’s pen, contributed to the team’s strong bullpen work with his imposing 12.0 K/9 rate and 3.36 ERA. Herrera’s performance in 2012 entrenched himself as one of the more valuable relievers in the league. As a 23 Year-Old armed with a power fastball, Herrera was second in the American League with 76 Appearances, while posting a line of a 2.35 ERA, 8.2 K/9, and 2.2 BB/9. The 22 Year-Old Catcher could be in position to have a breakout season in 2013. Perez led the American League in throwing out 41.9% of attempted base stealers while also demonstrating his offensive potential. Despite only having 289 at-bats due to a meniscus tear, Perez hit .301 – with 11 HRs and 39 RBI. The most intriguing aspect of Perez if he becomes the next great catcher in the game? He is signed to an ultra team-friendly contract through 2016 ($1.5M in 2014, $1.75M in 2015, and $2M in 2016) plus the team has three additional Option Years ($3.75M in 2017, $5M in 2018, and $6M in 2019). The earliest he can bee a Free Agent is 2018. George Kottaras for the cycle last year and managed to smack 9 HRs and drive in 31 RBI in just 171 AB during the 2012 year. 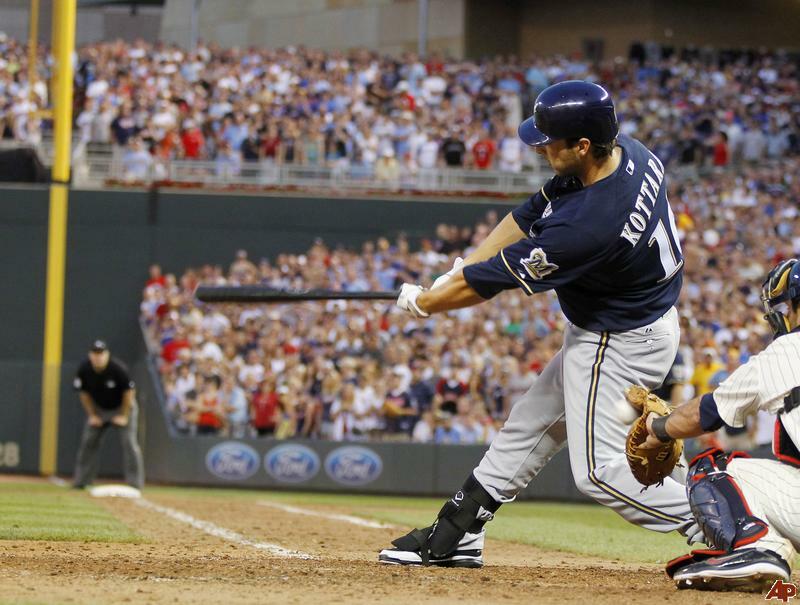 The 30 Year-Old Catcher split the 2012 season between the Brewers and Athletics, hitting 9 HR with 31 RBI. The Royals will be Kottaras’ fourth team over six years, but it appears he has the upper-hand on the backup catcher spot over Brett Hayes. Although viewed as defensively inferior to Hayes, Kottaras’ offensive upside could give him the edge. Hayes was claimed off waivers from the Miami Marlins, which at the time seemed to slot Hayes to be Perez’s backup; however, this plan could have been altered with the acquisition of Kottaras. As mentioned, Hayes and Kottaras will compete for the backup catching position. Although Hayes hit only .202 with 3 RBI in 114 AB with the Marlins in 2012, his defensive ability would be the reason he beats out Kottaras for the job. 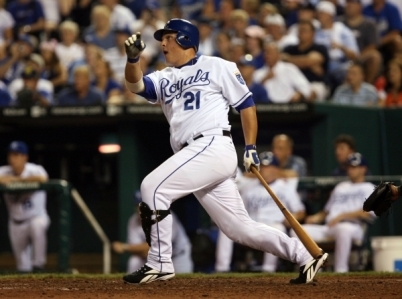 Billy Butler (Country Breakfast) heads into 2013 with a .300 Career Average and coming off a personal best year of 107 RBI in 2012. Butler established himself as arguably the preeminent designated hitter in the game in 2012, making his first all-star game and winning his first Silver Slugger, as the 26 year-old set career highs in HR (29) and RBI (107). The .300 career hitter provides a consistent presence in the Royals lineup, and he is signed for an affordable $8M in 2014 with a team option of $12.5M (with a $1M buyout) in 2015. He will be a Free Agent as early as 2015. The Shortstop acquired in the Zach Greinke deal with Milwaukee displayed solid production at the plate and around the base paths in 2012. Escobar finished with a .293 average, 5 HR, 52 RBI, and 35 SB. Although Escobar led the league with 19 errors, he was second in putouts and finished the season with a 3.5 WAR. If Escobar’s production and improvement continue, his contract, which can possibly run through 2017 (including options), appears to be a solid buy for the Royals. Escobar will make $3M in both 2014 and 2015 with Club Options for 2016 ($5.25M with a $500,000 buyout) and 2017 ($6.5M with a $500,000 buyout). Getz enters the 2013 season in a two-man competition for the starting second base job with Johnny Giavotella, with the loser likely slated for AAA. Getz provides a solid defensive option for the Royals but has had trouble remaining healthy. What Getz does not provide, however, is power; he has 2 HRs in 1,175 Career At-Bats and none since 2009. The third overall pick in the 2008 draft started his career strong in 2011 with a .293 Batting Average, 19 HRs, 78 RBI, and a .799 OPS; however, Hosmer experienced a decline in most offensive numbers during his sophomore season. In 2012, Hosmer hit .232, 14 HR, 60 RBI, and had a .663 OPS. Hosmer would certainly not be the first young player to struggle in his second season in the majors, but his production is pivotal to the Royals’ success in 2013. Moustakas ended the 2012 season with a .242 average, 20 HR, and 73 RBI, but he prominently slumped at the plate in the second-half. Although he improved his plate discipline, evident in an increased on-base percentage from his rookie 2011 season, Moustakas hit .211 with 5 HR and 26 RBI over the second-half of 2012, including a .204 September – with 1 HR. Much like Hosmer, the Royals are optimistic for Moustakas’ continued development. Although 2012 was an offensively inconsistent season for Moustakas, he led the league in assists, putouts, and double plays at 3B, while continually displaying impressive range. Acquired as the final component in the major offseason trade with the Rays, Johnson, who is out of options, appears to be a lock to make the team as a utility infielder. Johnson played 2B and 3B primarily in 2012 for the Rays and hit .242, 6 HRs, and 33 RBI in under 300 AB, while featuring 18 SB. In competition with Getz for the starting second base position, if Giavotella shows signs of the ability to translate his minor-league career hitting to the majors, the job can be his. The 25-year old has a career .308 minor league average with positive power trends, culminating with a stat line of .323, 10 HR, and 71 RBI in 2012 at AAA Omaha. The starting left fielder is coming off consecutive Gold Glove seasons and is scheduled to make $10M in 2014 and $12.5M in 2015 (with a $12.5M player option for 2016). 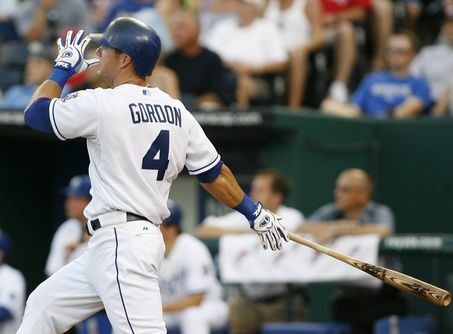 Although most of Gordon’s offensive numbers slightly declined from his breakout 2011 season (.303 average, 23 HR, 87 RBI, .879 OPS), he led the junior circuit in doubles with 51, contributed solid global offensive production (.294 average, 14 HR, 72 RBI, and a .822 OPS), and finished with his second consecutive season in the top ten in the AL in WAR (7.1 WAR in 2011 and 6.2 WAR in 2012). Although it might have taken longer than anticipated, Gordon has solidified himself as an all-around impact player. He could be a Free Agent as early as 2016. In 2014, he will make $10 MIL and then $12.5 MIL in 2015. There is also a Team Option to pick Gordon up for an additional $12.5 MIL in 2016. He can be a Free Agent as early as 2016. 2012 was a forgettable year for the strong-armed RF, as he finished with a .235 average, 16 HR, and 49 RBI coming off his strong 2011 season (.285, 20 HR, and 87 RBI) in which he quietly made one of the most spectacular catches a baseball fan will ever witness when he climbed the wall to deny the Mariners’ Dustin Ackley of a HR. If Francoeur struggles early in 2013, he might find himself losing playing time in what appears to be his final year in a Royals’ uniform. 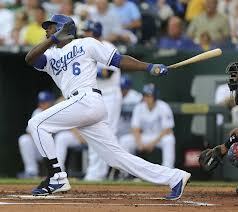 Lorenzo Cain is a potential 30/30 player in the MLB some day. he must learn to hit on the road. He has a 3 Slash Line of .352/.390/.890 at Kauffman last year – while he hit .184/.246/.588 on the Road with just a little over 100 AB for both. The question everyone wants to know: Can Cain remain healthy? Cain, another component in the Greinke deal, battled groin, hip, and hamstring injuries in 2012 and is working through a hand injury early in spring training. Injuries aside, he is designated as the starting CF for 2013 and hit .266 – with 7 HRs and 31 RBI in 244 At-Bats in 2012. With the likely decision to carry two Utility Infielders and seven relief pitchers, there is only room for one extra Outfielder, and Dyson appears to be that man. The speedy Dyson, who is out of options, stole 30 bases in only 292 At-bats in 2012, and he should be liberally utilized in late-Inning Pinch-Running situations. 2012 was the final year of Crow’s negotiated major league contract out of the draft, which saw him make $1M in 2010, $1.4M in 2011, and $1M last season. While there has seemingly been constant chattering that Crow would wind up in the rotation, there is no such discussion entering the 2013 season. Crow has established himself as a formidable, reliable presence in the Royals bullpen. Crow tied Herrera for the team-lead with 19 holds in 2012, and followed up his all-star 2011 rookie season by appearing in 73 games last season, compiling a 3.48 ERA, and reducing his WHIP from 1.39 in 2011 to 1.18. 2013 is Crow’s final year of pre-Arbitration status, so it remains to be seen what the Royals will offer him. Under Moore, the Royals have traditionally determined pre-Arbitration contracts based on service time, so it would be reasonable to expect a figure similar to Collins’ 2013 salary of $534,500. The former Arizona Diamondback was added to the 40-man roster over the winter and will complete for the final bullpen spot. Gutierrez pitched at three different minor league levels in 2012 and is coming off a strong performance in winter ball, being named Reliever of the Year in the Liga Venezuela Beisbol Profesional Caribbean League (0.81 ERA with 14 saves in 24 games). The Left-Hander should be ready to resume pitching around mid-year and will most likely spend time in the minor leagues before seeing any big league duty. Coming off Tommy John surgery, Duffy had 9.1K/9 with a 3.90 ERA in six games last season before getting suffering his injury. Mendoza, fresh off being named the Caribbean World Series MVP, is among the three candidates in contention for the fifth starting position, although it appears that he might be at the back of that trio. Despite starting 25 games last year for the Royals, Mendoza will most likely find himself in long-relief for the club. Similar to Crow, Mendoza is at the mercy of the Royals’ offering for his 2013 salary, as he is in his final year before his arbitration eligibility commences in 2014. Considering Mendoza’s service time, expect his salary to come in somewhere north of Holland’s $539,500, possibly in the $545,000-$550,000 range. The Royals have $39.68M guaranteed in contracts for the 2014 season in commitments to Arguelles, Butler, Davis, Escobar, Gordon, Guthrie, and Perez. Assuming they pick up Shields’ 2014 option, the Royals will have a committed payroll of $51.68M heading into the 2014 season with those eight players alone. With Crow, Collins, Holland, Mendoza, Hosmer, and Johnson all set to enter their first year Arbitration Eligibility in 2014, each of these players will likely see moderate-to-significant increases in their salaries. From a macro perspective, assuming options are exercised, Moore has a solid core of non-pitching players locked up through the 2015 season in Perez, Butler, Gordon, and Escobar to compliment Hosmer and Moustakas (who are both not eligible for Free Agency until after the 2017 season), which undoubtedly factored into his decision to trade Myers to Tampa. Gordon has come off of back to back great campaigns in 2011 and 2012. He led the AL in Doubles last year with 51 – and scored 93 Runs.In the 2nd half of the year, he had a 3 Slash Line of .316/.371/.871. Add back to back Gold Gloves in Outfield – and you are talking about a player finally fulfilling his talent. Posted on March 5, 2013, in MLB Payroll and Contracts, The Rest: Everything Baseball and tagged 1985 World Series, 25 man roster Kansas City Royals, aaron crow, al central, alcides escobar, alex gordon, American league, angels, billy butler, brandon sisk, brett hayes, bruce chen, carribean world series, chris getz, Chris Getz. Johnny Giavotella, christian colon, cy young, dan wheeler, Danny Duffy, Donnie Joseph, eric hosmer, ervin santana, Everett Teaford, Felipe Paulino, francisely bueno, Francisley Bueno, george kottaras, greg holland, Guillermo Moscoso, J.C. Gutierrez, jake odirizzi, james shields, jeff francoeur, Jeremy guthrie, jonathan broxton, Kansas city, kansas city royals, kansas city royals payroll 2013, kauffman stadium, kelvin herrera, lorenzo cain, louis coleman, luke hochevar, michael mcGraw, Miguel Tejada, mike moustakas, Nate Adcock, ned yost, oakland athletics, ryan dana, salvador perez, tampa bay rays, tigers, tim collins, tommy john, wade davis, wil myers, zack greinke. Bookmark the permalink. Leave a comment.